These unique "bayonets" are believed to have been manufactured by T.A. Potts of New Orleans based on one known marked example. 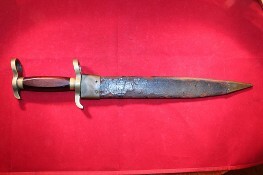 All other matching bayonets have no markings, this one included. 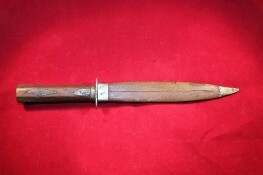 This is a fine example of this rare and unique bayonet with original scabbard. The blade is bright with minor oxidation specks and measures approximately 12" in length. The leather scabbard shows signs of age and cracking throughout and is beginning to pull away at the seams on the reverse due to the drying out of the leather over time. The rosewood grip is near excellent with little wear and features circular brass attachment rings at the cross guard and pommel which have a pleasing smooth patina. There has long been discussion over what this weapon was used for given it's unique design. Seeing as how there is no cutout for the front sight of a rifle, my opinion is that these were not used as bayonets but as side knives that had the capability to be attached to a pike if needed. This is a very interesting 8" Civil War era Dagger/Dirk with a nice leather scabbard in very good shape. I'm typically not one for giving a lot of validity to verbal stories but the story that accompanied this one certainly seems plausible. The verbal story on this piece is that a Confederate soldier made this and gave it to his wife as a present. It was a means to protect herself on the family farm alone with the kids while he was away at war. He wanted the knife to be practical if needed and a way for her to know that he would always be watching over her so he incorporated his brass wedding band into the knife between the hilt and the handle. 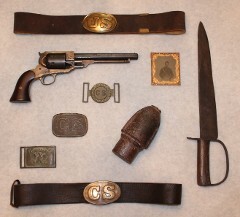 While that is merely a story, the weapon certainly has a brass wedding ring attached and it probably didn't have the durability of a piece a soldier would want to take off to war with him so it makes sense it would be used by someone on the home front to protect themselves should the need arise.